Our regular readers may know that I regard chess as a fine metaphor for Strategy & Strategy Deployment. To be fair, chess (and choir) were fun and have provided me with some modest skill & insight. Here’s a fine piece by Peter Coy on how chess insight might be applied to the Ukraine crisis. If Coy and Kasparov are correct, making things tough on the 140 or so oligarchs that keep Putin afloat should put enormous pressure on him. The trick, Coy suggests, as in the Cuban Missile Crisis, is to leave Putin some face-saving cards to win. I would add that, as always, the most important thing is to clearly define Purpose. You can’t win if you don’t know what you’re playing for. 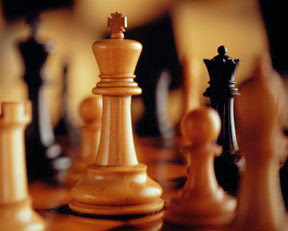 In chess, the purpose is clear – checkmate the other fellow’s king. What’s the US and EC’s Purpose in the Ukraine crisis? The stakes are high. Let’s see what happens.